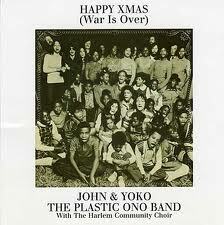 “Happy Xmas (War Is Over)” is a song written by John Lennon, released as a single in 1971. Initially, the song was not a success in the U.S., due to lack of promotion and being recorded too close to Christmas, but it eventually reached #4 on the British singles chart in 1973; a UK reissue after Lennon’s death in 1982 gained two notches, stopping just shy of the top position at #2. The song’s first appearance on album was the 1975 compilation Shaved Fish. Although ostensibly a protest song about the Vietnam War, it has become a Christmas standard and has appeared on several Christmas albums. The lyrics are based on a campaign in late 1969 by Lennon and Ono, who rented billboards and posters in eleven cities around the world that read: “WAR IS OVER! (If You Want It) Happy Christmas from John and Yoko”. The cities included New York, Los Angeles, Toronto, Rome, Athens, Amsterdam, Berlin, Paris, London, Tokyo, Hong Kong and Helsinki. At the time of the song’s release, the US was deeply entrenched in the unpopular Vietnam War. The line “War is over, if you want it, war is over, now!”, as sung by the background vocals, was taken directly from the billboards. 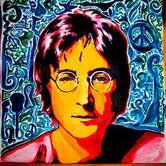 “Woman” is a song written and performed by John Lennon from his 1980 album Double Fantasy. Written by Lennon, it is an ode to his wife Yoko Ono, which is introduced by Lennon whispering, “For the other half of the sky …”, a paraphrase of a Chinese proverb. With subtitles in Spanish. A day like today he would have been seventy. Our homage today is one of the simplest, most moving songs of all time. A hymn of the last decades of the 20th century.